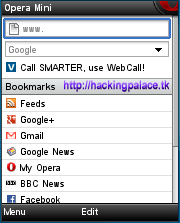 Download Facebook v2.7 handler for JAVA Mobiles. Using this modded app, you can change FrontQuery, BackQuery Custom Server etc. so that you can Get free Facebook access in your area. Now use facebook on the Go!. Using this you can Share Photos, Videos, Links, Updaet your status or you can do almost anything that you do on Facebook from your Computer. Also, it is very fast and loads in a few milli seconds too.